Hooray! I received the Premio Meme Award from Theresa of Studio618. 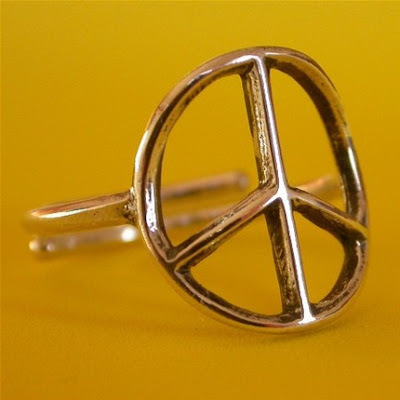 She is the creator of the fabulous peace sign ring pictured. Theresa fabricates these herself! The rules are simple. I just share 7 facts about myself, and pass the award on to another 7 worthy bloggers. 1. It's my Grandma's fault that I'm addicted to beads. 2. I believe coffee is the nectar of the gods. 3. If it wasn't for Etsy Dallas, I would have convinced my husband to move back to Austin, TX. 4. Even though I'm from Austin, I went to the rivalry school, Texas A&M, and had the time of my life. 5. I don't think I want kids. I just want to be the "cool auntie" to my friends' kids. 6. My favorite artists are Peter Max and Pamela Michelle. 7. I just convinced my apartment complex to let me paint my walls!! Hey awesome!! Thanks Miss Mandi, a.k.a. coolest aunt in the world. Wow! Thanks Mandi. That's quite an honor. Hi Mandi!! Thank you so much! :) I'm feeling the peace and love! !